A decidedly Italian executive car, the Quattroporte is a very different and very exclusive alternative to the likes of the Porsche Panamera, Mercedes S-Class and BMW 7 Series. The Levante is Maserati’s first ever SUV, and it’s looking to attract the kind of buyer who is tempted by the Porsche Cayenne and BMW X6. We’ve driven it in the UK to see if it’s succeeded. 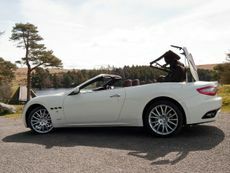 Read the Maserati GranCabrio convertible (2010 - ) expert review by Auto Trader's motoring experts, covering price, specification, running costs, practicality, safety and how it drives. Read the Maserati GranTurismo S coupe (2009 - ) car review by Auto Trader's motoring experts, covering price, specification, running costs, practicality, safety and how it drives. Read the Maserati Quattroporte S saloon (2009 - ) car review by Auto Trader's motoring experts, covering price, specification, running costs, practicality, safety and how it drives.